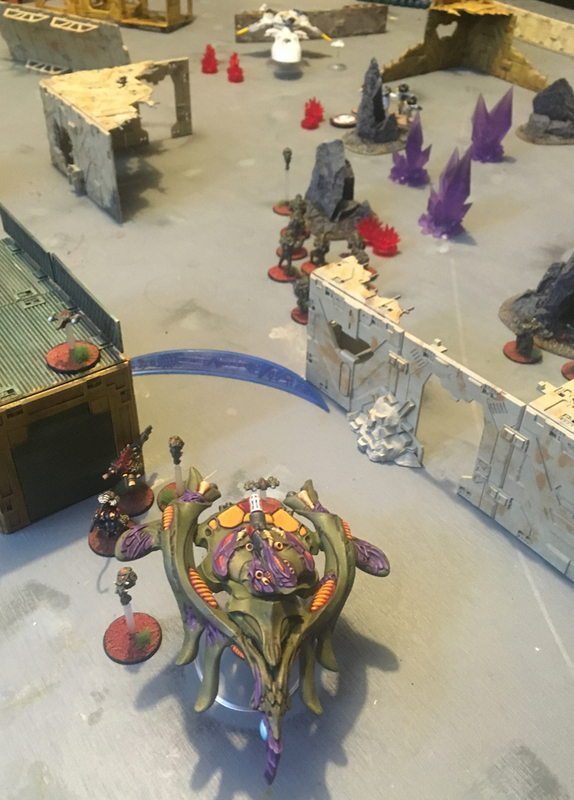 Jeremy was over today with 1000pts of Concord minis to play against my Isorians. 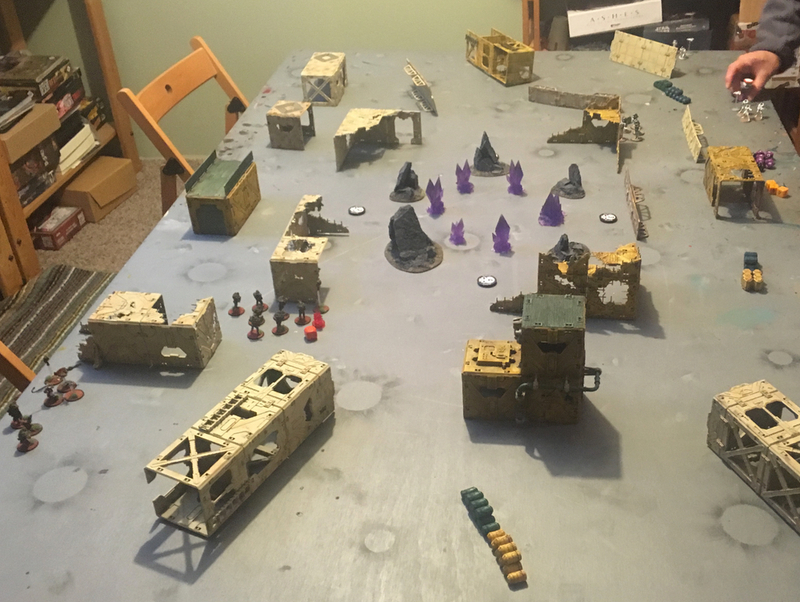 I decided to build a scenario based on the terrain I had on hand. 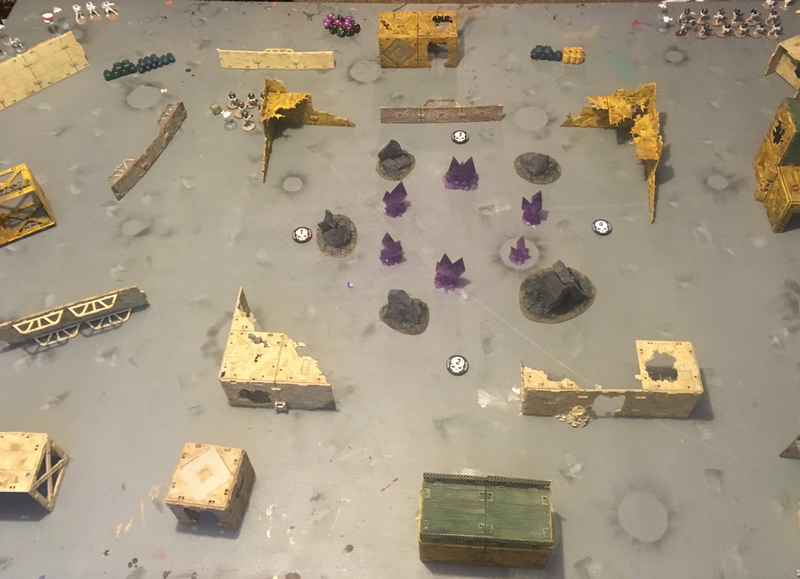 I put some crystals and rock formations in the middle of the table to represent an outburst of a crystalline energy form that caused an explosion wrecking the surrounding territory. Scientists put down energy dampening and control facilities to contain it and now Concord and Isorian forces are moving onto the location to take control of it and use the energy. There are four objectives around the central section of the table which represent each control facility. The game runs six turns and whomever controls the most objectives will gain control of the energy and win the game. There are triangular section at each corner of the table 12″ in width and height. 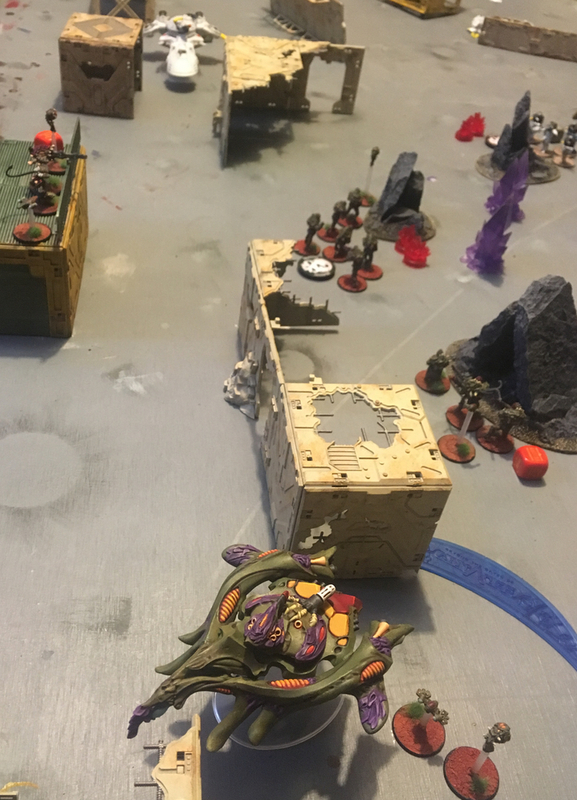 Each side is able to deploy half their force (fractions rounded down) and then bring the rest on starting with the second turn as per the standard rules. Deployment is from the 12″ edges of the initial deployment area. 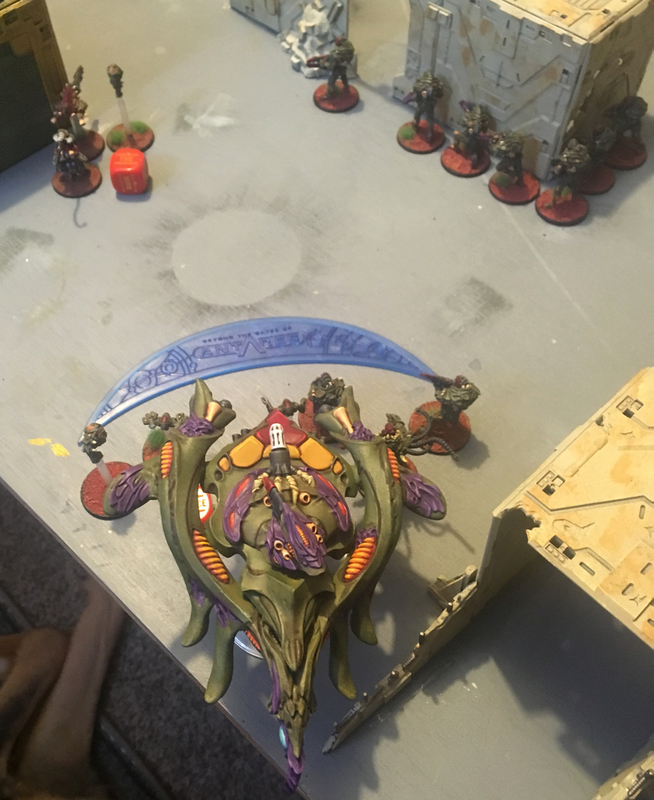 Sadly I was not able to get the table repainted and so it still suffers from some of the paint marks that the twins put in it painting their AoS figures. Both of us started out with three units deployed. I put out my Sniper, a unit of Phase Troopers and the X Launcher team. 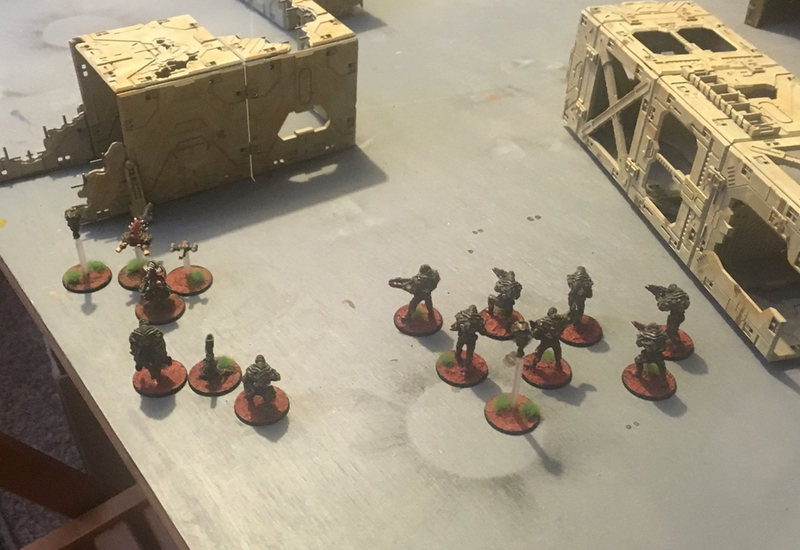 Jeremy started out with almost the exact same deployment swapping out the Sniper for a Command Team. The first turn went pretty quickly with no fire and both of us trying to move forward towards the objectives. In turn two there was advancing and very little fire. 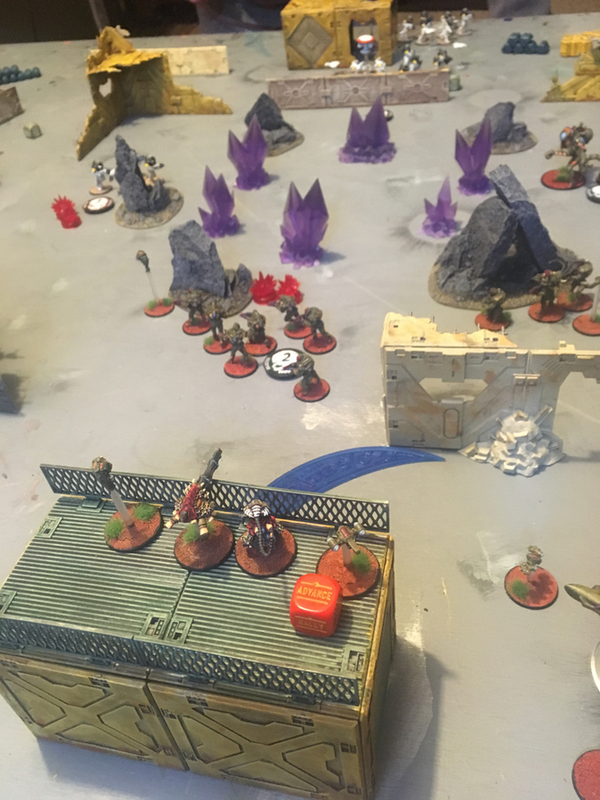 My turn might have gone better if I hadn’t missed command rolls on one Phase Trooper squad and both rolls for the Mahran Vesh. Not fun. Turn three saw Jeremy push several units across the top of the map towards objective 3. 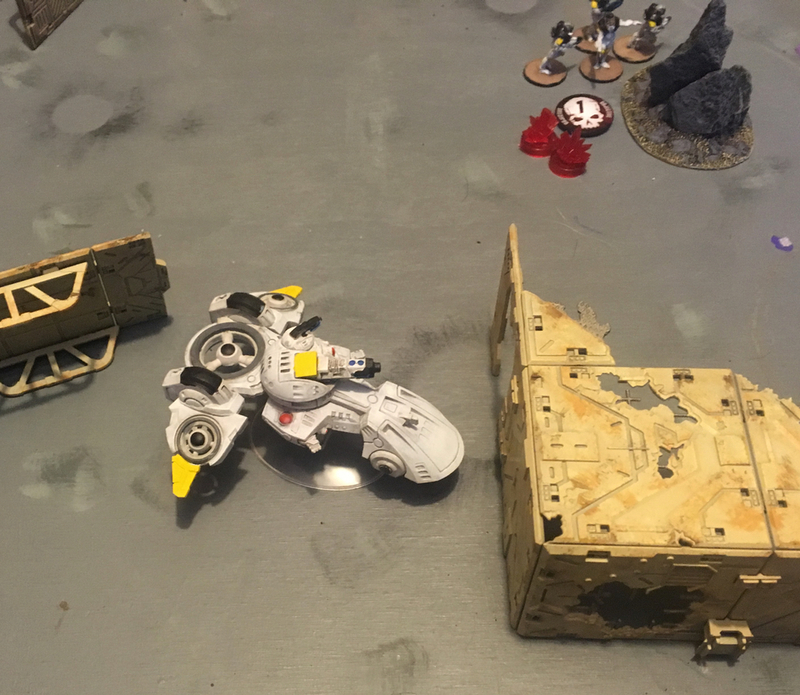 He had a squad controlling objective 1 and was backing it up with his combat drone (which looks awesome!). My intent was to push towards objective 2 and 4 and then try to wrest one of the others from his grasp. 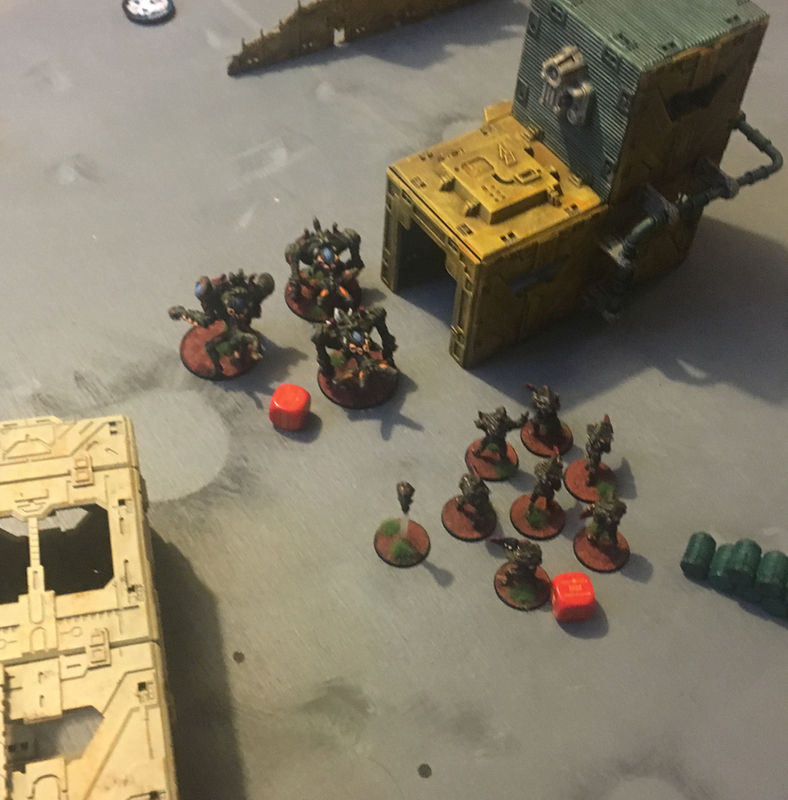 The Tsan Ra Torus squad ran towards #4 and my command squad and first phase squad moved along the terrain to get into range to control #2. 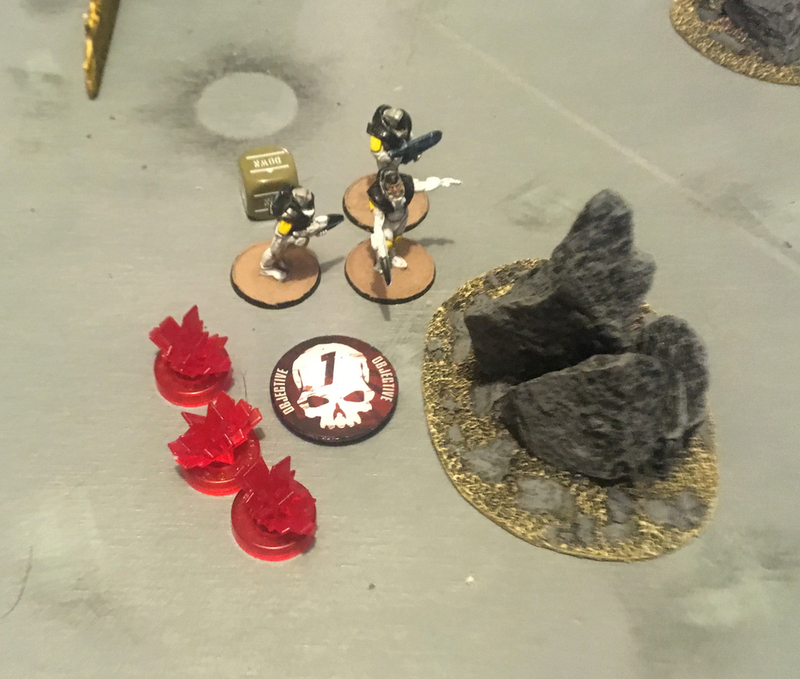 The X Launcher sent a Scramble shot towards Jermey’s squad controlling objective 1 and then I tried to use the Sniper to take out some of the troops but had very poor rolls. 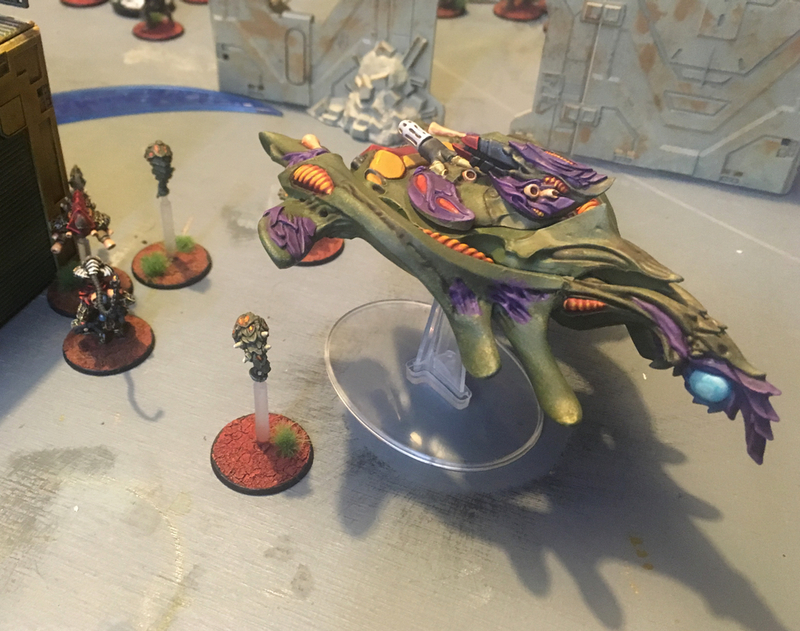 I managed to bring on the Mahran Vesh and parked it next to the command squad so that the batter field would cover them all. It exchanged some rather inefficient fire against Jeremy’s combat drone. At Long range the Compression Cannon only reduces the Res of the Concord drone to 9. So I needed to decide whether to close to Effective range or fire at something else. 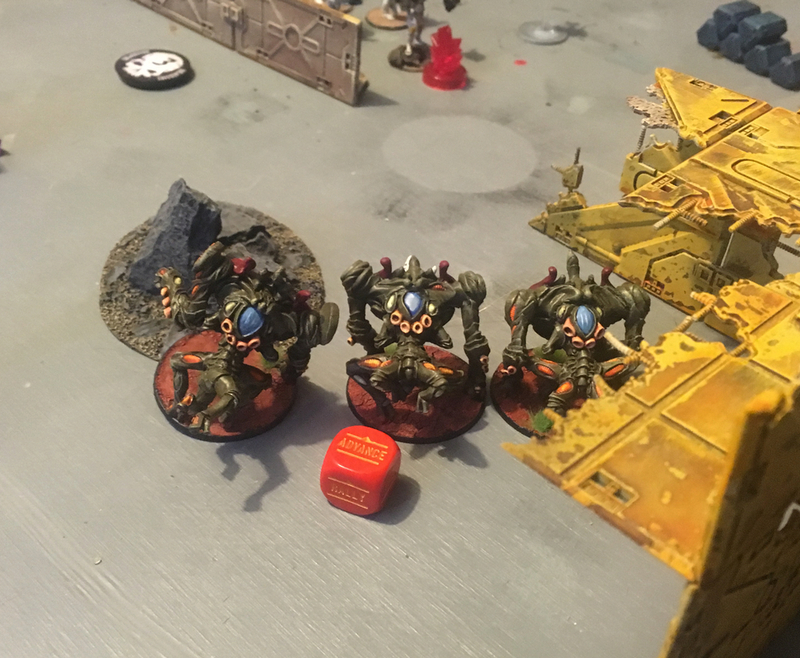 The Tsan Ra squad made its way slowly towards their objective. I should have deployed them initially so they would start closer to an objective or opponents. 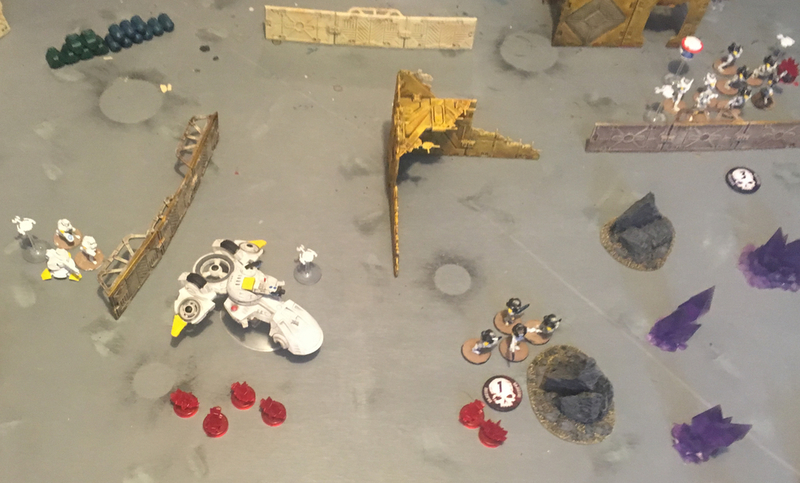 Jeremy moved his Combat Drone and fired at the Mahran Vesh but missed. My X Launcher dropped a Scramble round next to the drone and managed to shut down the batter drone. Now I just needed to get closer. 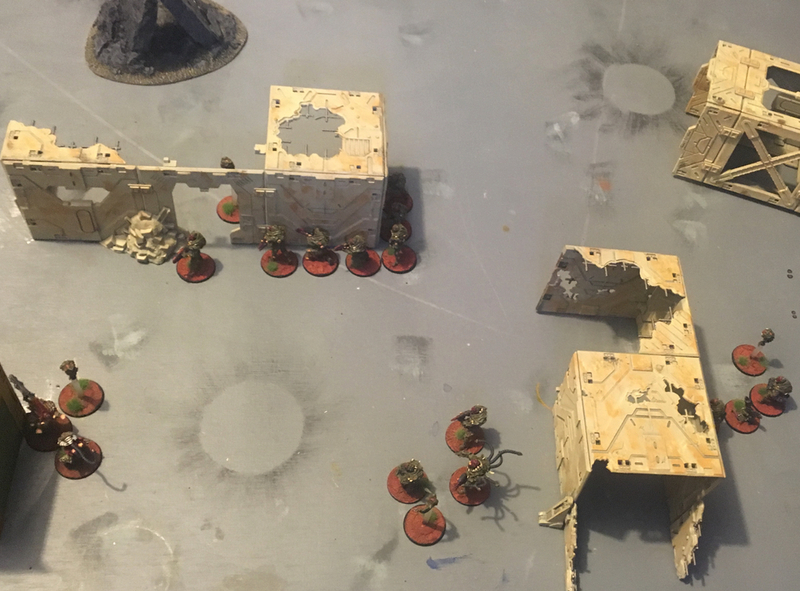 I took a risk and moved one of my Phase Squads out into the open to position them to attack objective 1. 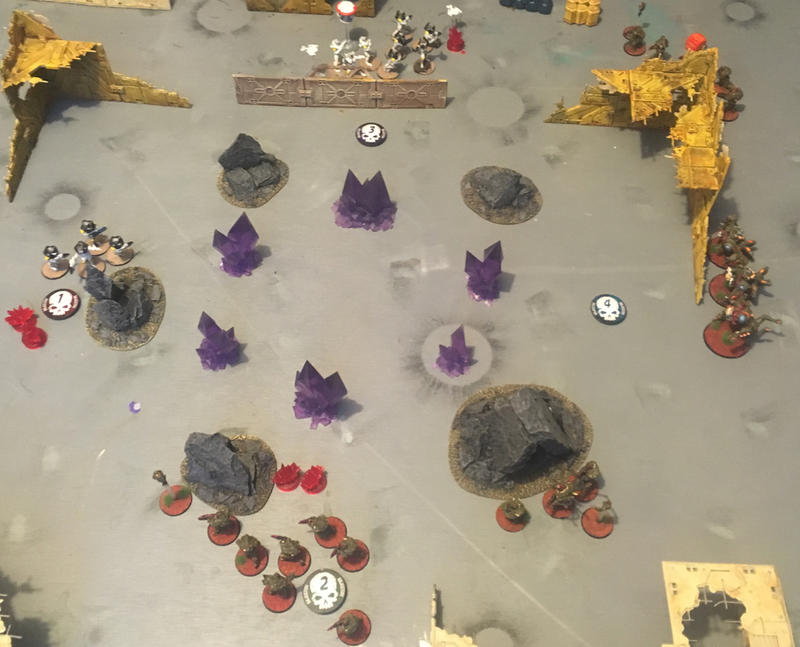 Jeremy took the opportunity to use his X Launcher on Ambush to drop a Net round on them. Thanks to some Spotter Drone patching he hit and added three Pin markers. Ouch! 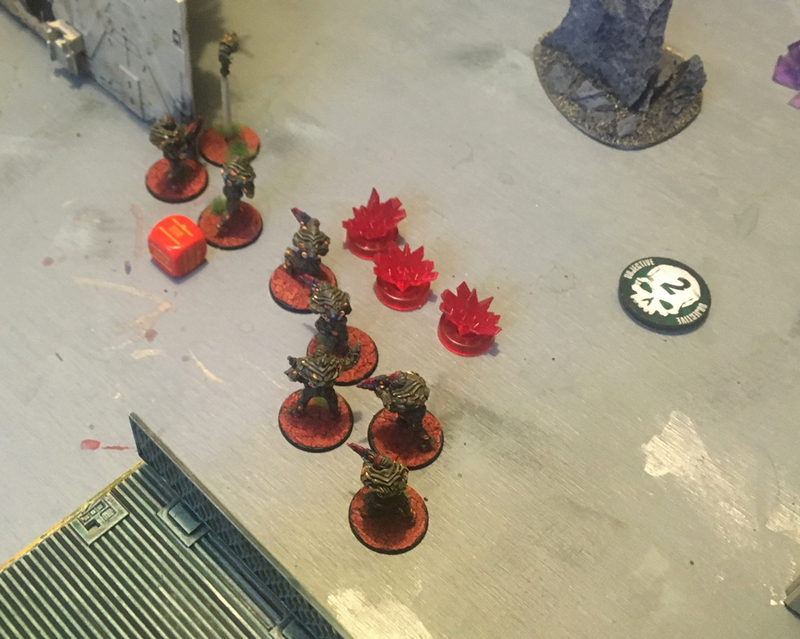 Turn four started with my moving my Netted Phase Squad closer into the cover. Thanks to my Command Squad I made the Advance order and also managed, even with the -2 Acc penalty, to take out some of the Concord troops on Objective 1. 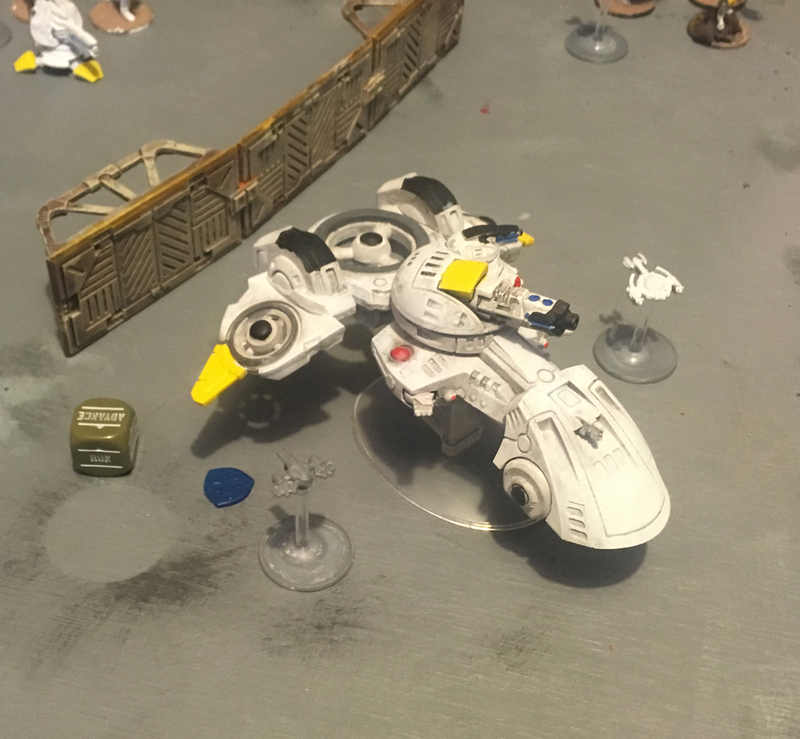 I Advance my Mahan Vesh and shoot at the Concord combat drone. The Compression Cannon missed and even with the reduced Res due to the Scramble round I was unable to do anything with the PLS. I am putting a lot of Pin Markers on it. 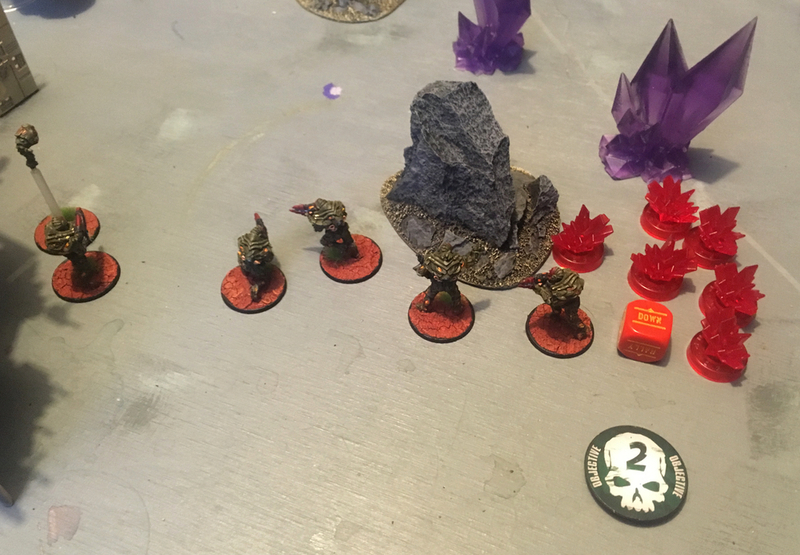 My Tsan Ra make it to the terrain next to objective 4 and in order to slow down Jermey I move my Phase squad around the corner and put some fire into one of his squads. I do almost nothing and will be relying on the Phase armour to save me from return fire. 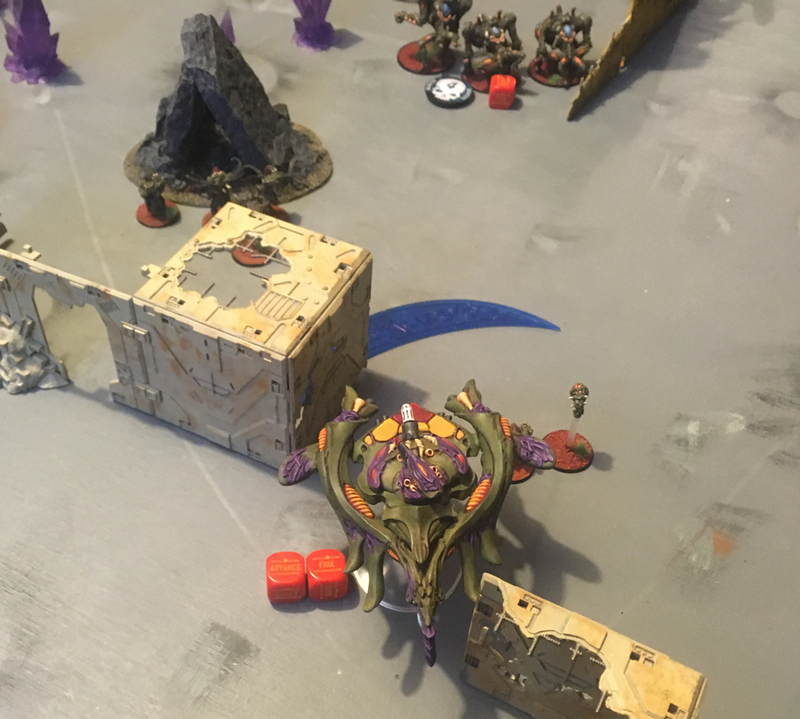 Jeremy moves his Plasma Cannon up and tucks it behind some cover to keep it safe. 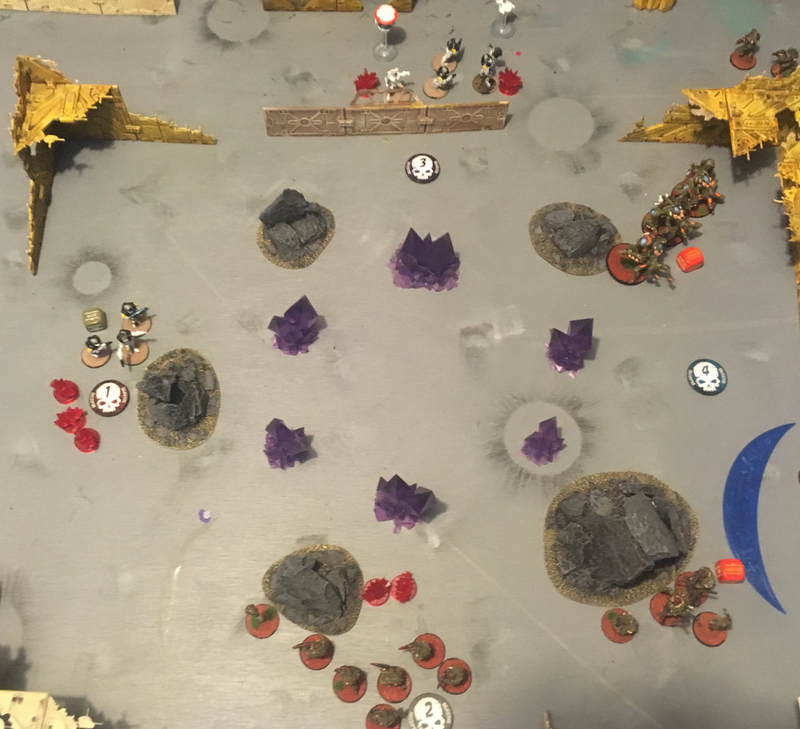 My Sniper moves up onto some terrain and takes a shot at Jermey’s Command Squad. No luck. 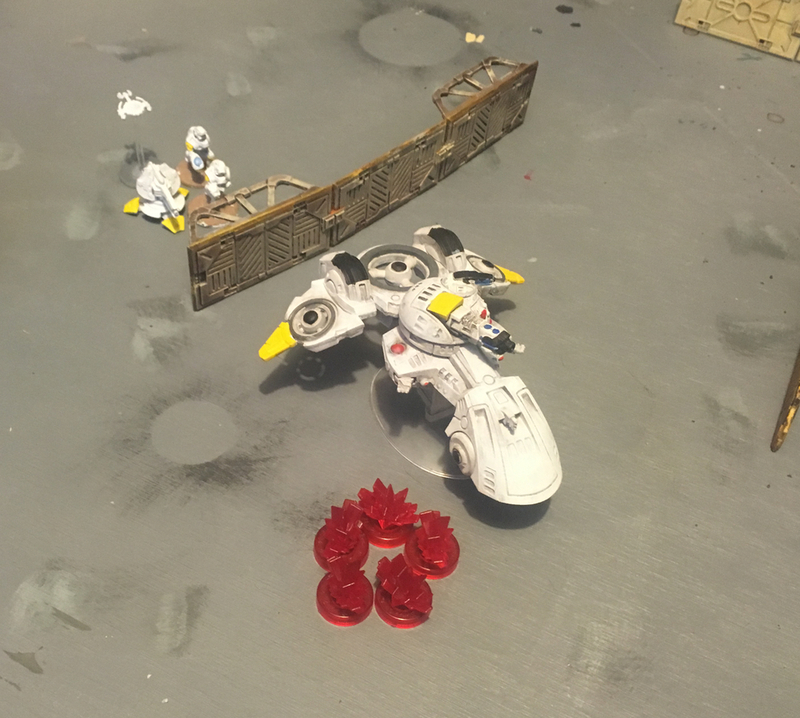 Jeremy managed to Rally his Combat Drone before I could drop a Net round on it to try and break it. He moves it behind cover to keep it safe for a while. 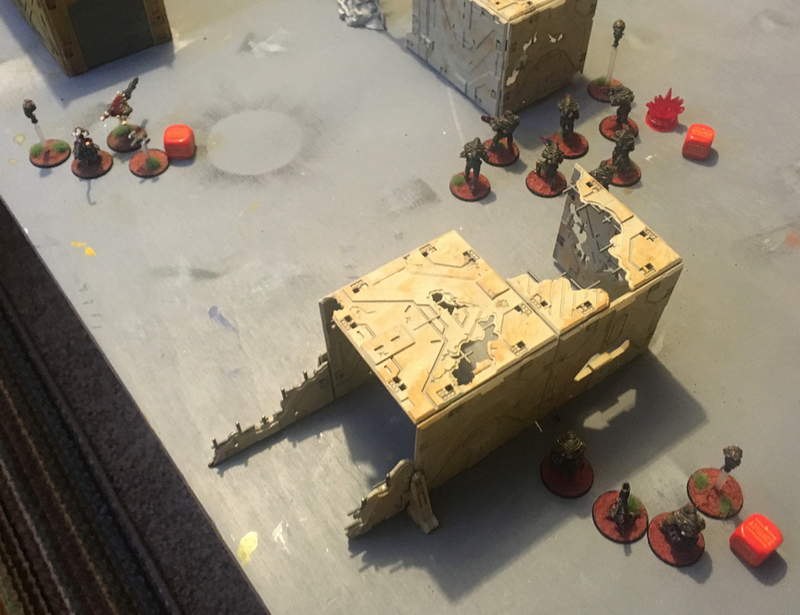 I move my Mahran Vesh to where it can shoot at the Concord troops at the north of the table. I manage to take a few out. Apparently Concord armour can’t stand up to a Compression Cannon. 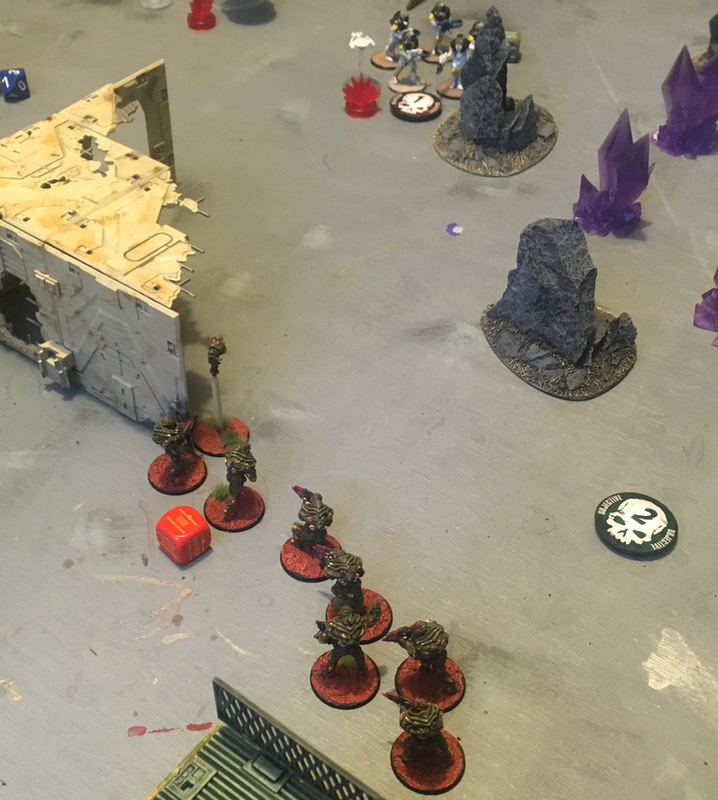 I advance the Tsan Ra forward but can’t keep them in control of the objective and get into within 10″ to fire and then charge. 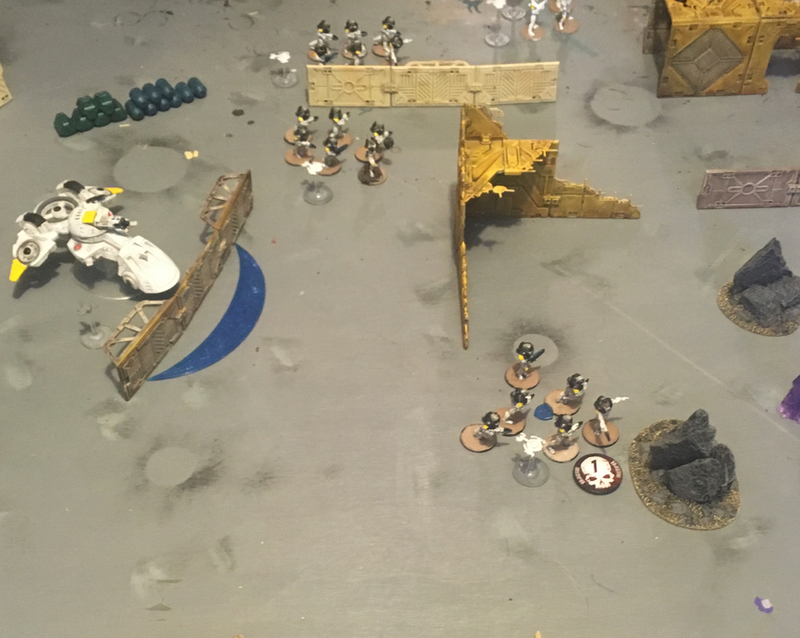 Jeremy moves his combat drone to take a flank shot at my Mahran Vesh but doesn’t damage it. All either drone has done to the other is chip the paint. The squad holding objective 1 takes some more fire and passes their break test. They are already Down so it has no additional effect. My northern most Phase Squad has managed to weather some fire from Jeremy’s troops and between the Tsan Ra and them I have reduced one of his squads to three troops. 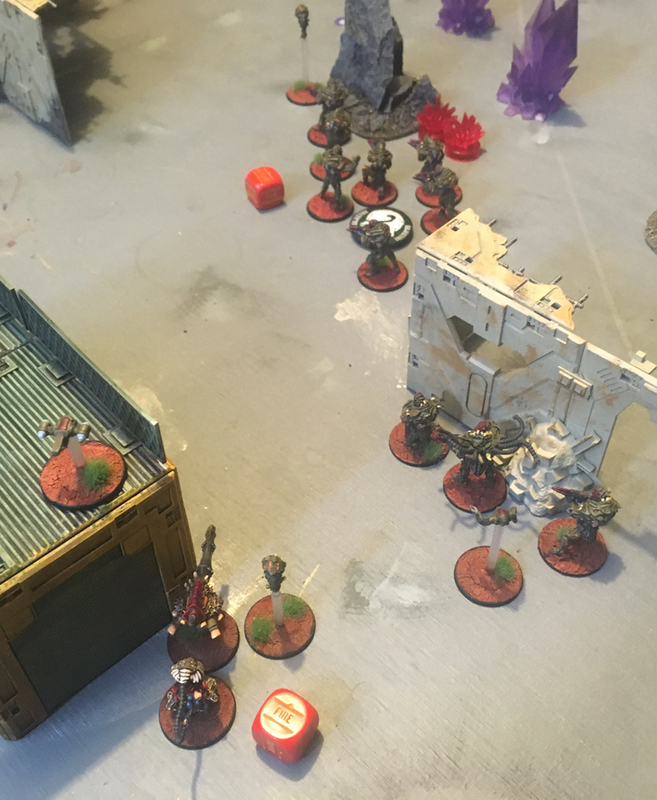 My Sniper finally managed to get a decent roll on her D6 Rapid Fire and pumps 5 shots into Jeremy’s Command Squad. It is reduced to just the Commander and he passes his Break test. Things run downhill from there for Jeremy. 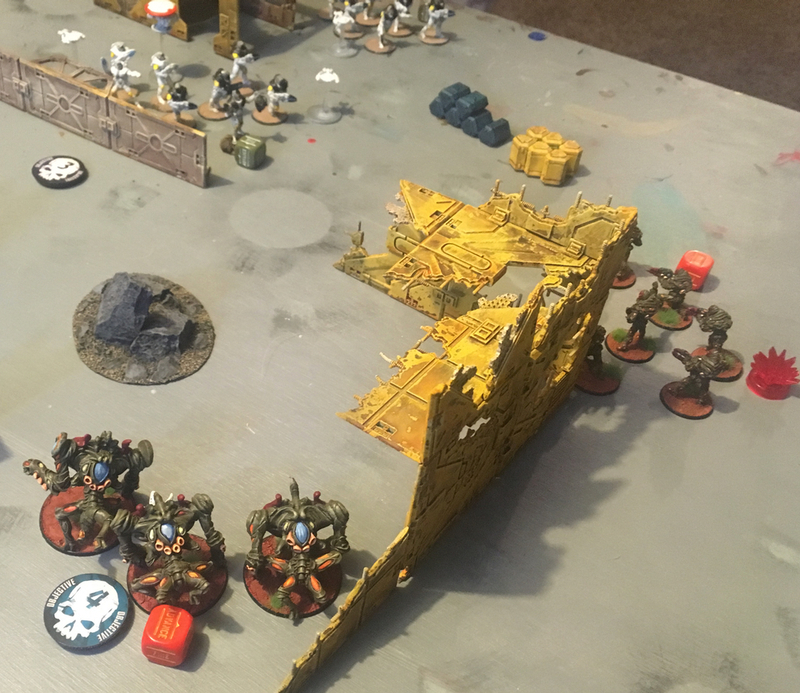 I have two of the objectives and I doubt I can move him from objective 3 so I focus on the troops on objective one and after some fire from my Mahran Vesh they break and the objective is clear. 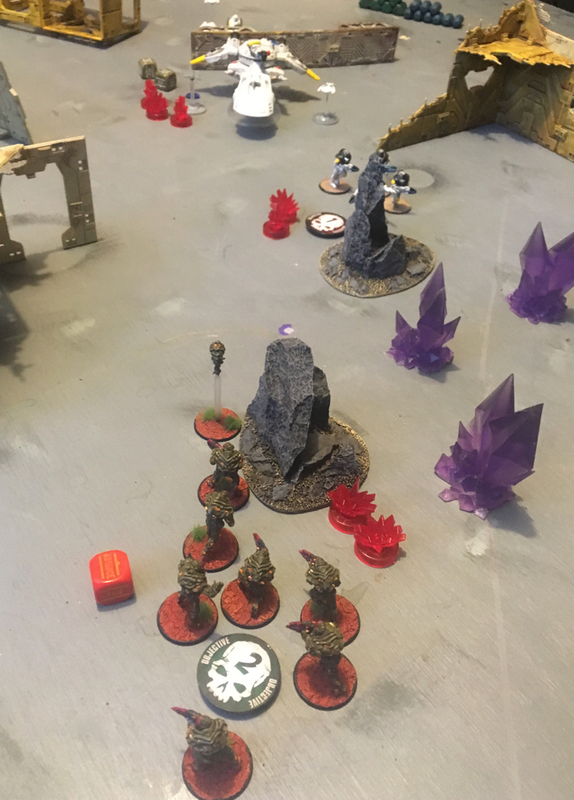 Jeremy tries to break my squad holding objective 2 but I pass a Break test. The game ends with me holding two objectives and Jermey holding one. So close to breaking it! So I got to try out some new toys. 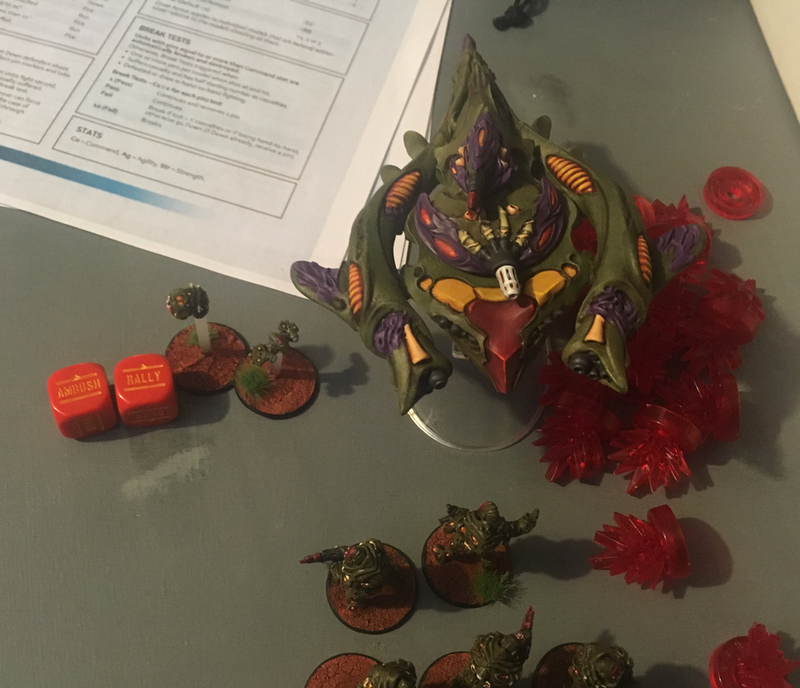 I don’t want to make a judgement on the Mahran Vesh with a Compression Cannon since Jeremy was really lucky with his Res rolls. I used the Compression Cannon since I assumed that Jermey would bring his combat drone and it certainly can put out a lot of fire with that and a PLS. The Sniper was awesome even with me inadvertently creating a scenario that invalidated the Sniper special rule. As usual it was a much better game with a scenario. 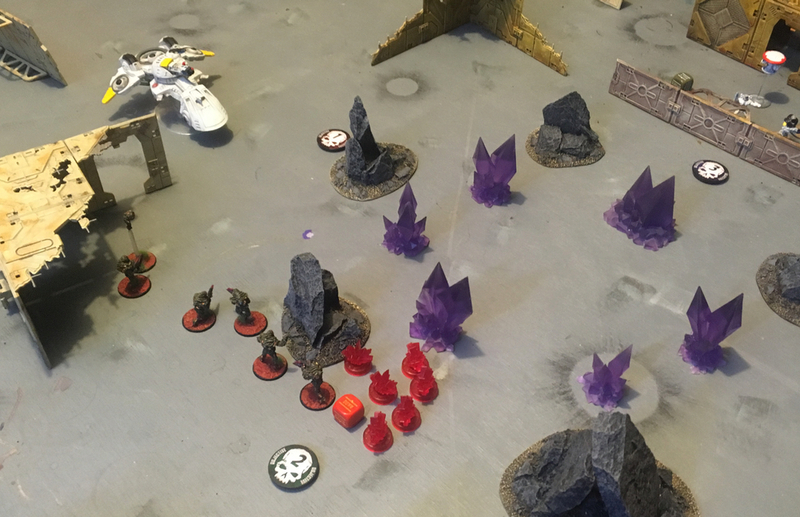 Not that Antares suffers without one but I am really convinced that objectives and non-combat goals in a game make for a better experience. I need to make sure, in future games, that I can push the Tsan Ra as forward as possible or use a transport drone to make sure that they can get into range and into close combat. They were effective but they could have been much more of a threat and that came down to my deployment and placement. Having a proper command squad is a significant change from the Ghar Rebel army. 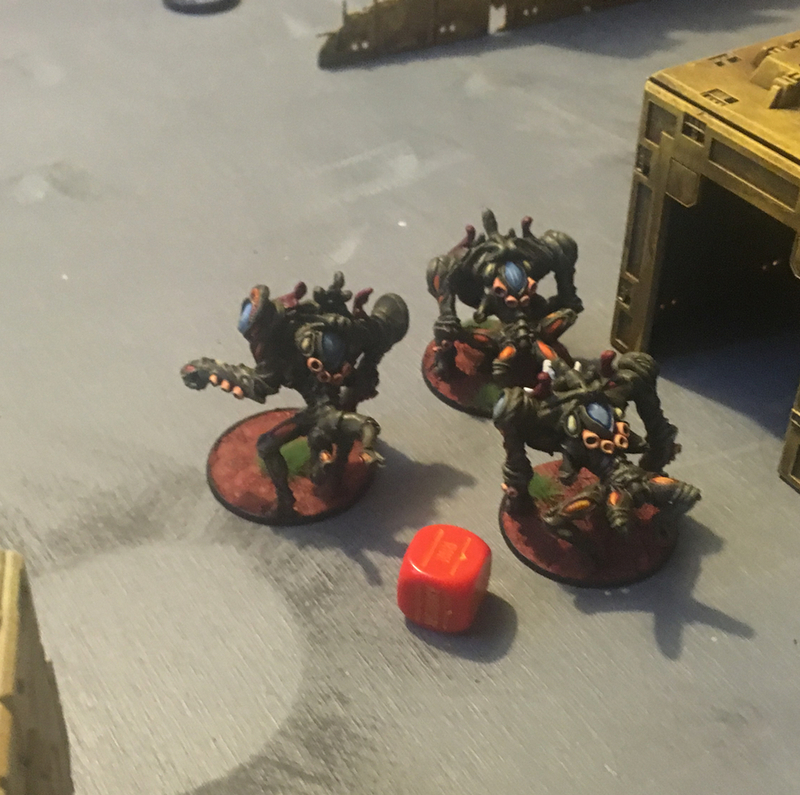 It made the difference in several rolls and it wasn’t there to save my squad from a Break test at the end of the game but it was a great bit of added security. As before, the X Launcher was a dream. The different ammo types are far more useful than just dropping a high explosive round. Getting the Batter field dropped when firing at the combat drone was a great thing. Its also wonderful to put Scoot rounds on troops holding an objective as well. I like it so much that I may get another to add to my army. 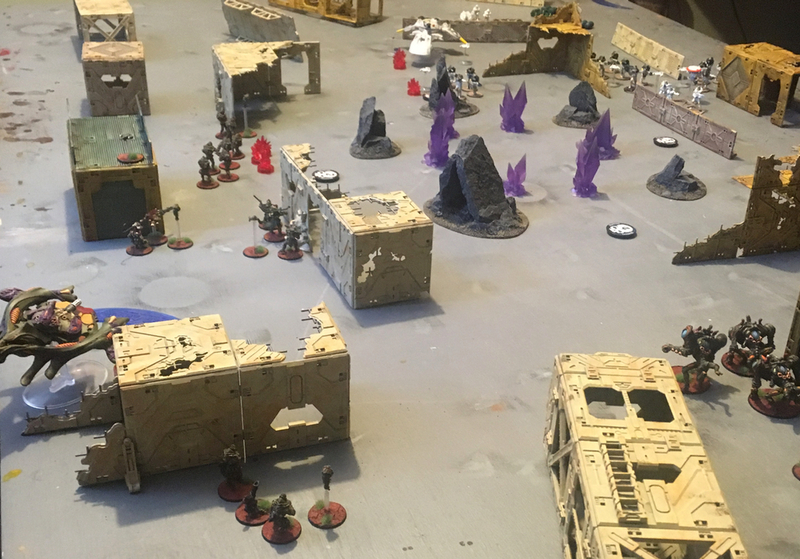 So lots of things to consider for my next game as well as some more troops to get painted so I can play a larger game and maybe get 2000 points painted.